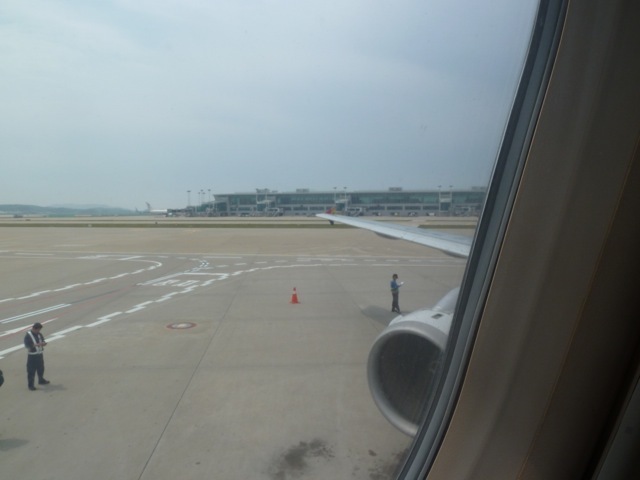 I arrived in Seoul the previous afternoon on the Asiana Airlines flight from Frankfurt. 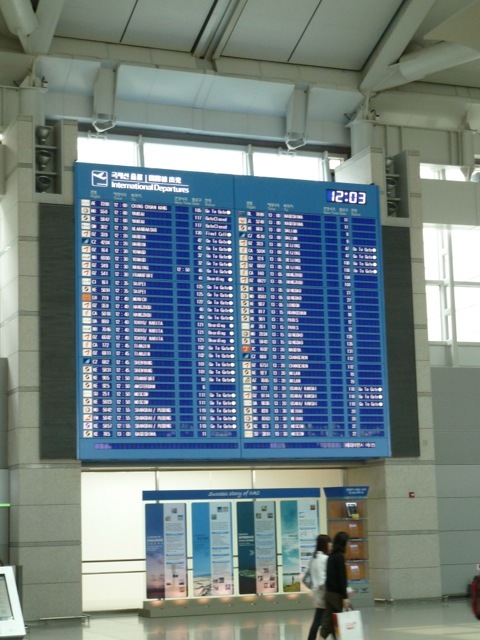 For all practical purposes I might as well have stayed at a hotel close to the airport, seeing as Seoul’s international Incheon airport is rather far out of town. But then again, I always find airport hotels rather depressing, no matter how nice they may be. 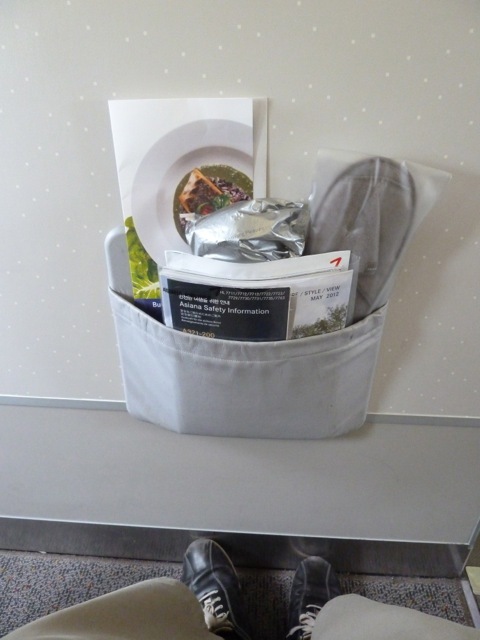 Seat: 1B, aisle. 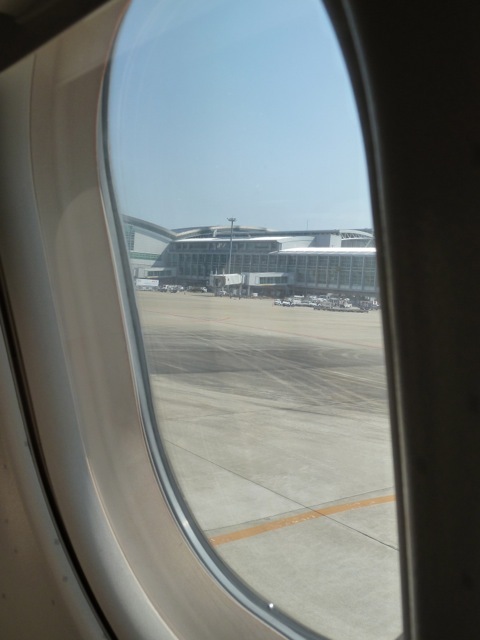 Just before pushback I move to 3D, window. 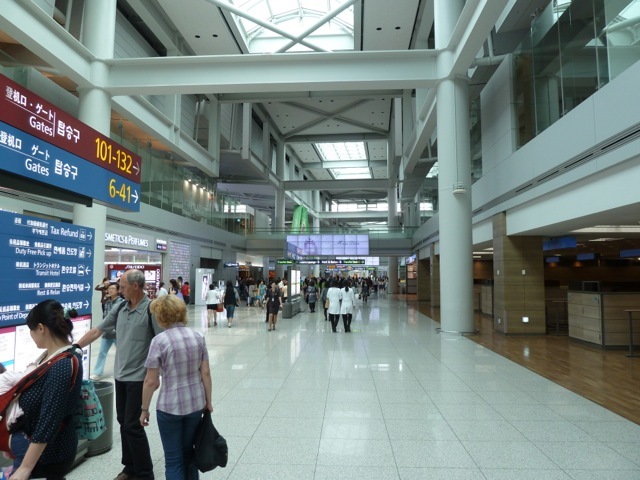 To get to the airport, I take the Metro line 1 from City Hall to Seoul Station and then from there the Airport Express to Incheon. 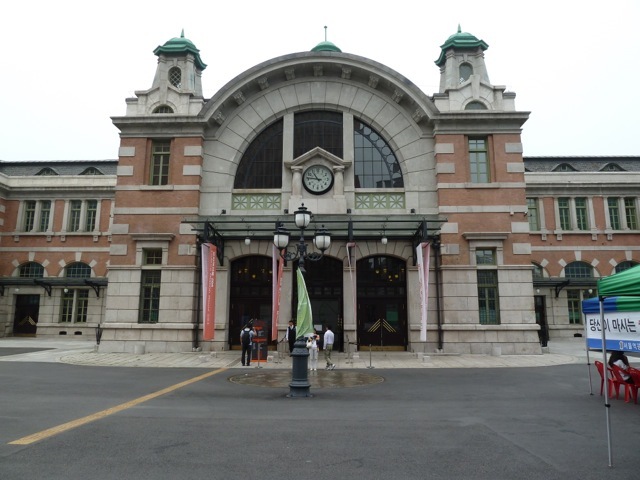 The railway station of Lucerne inspired the original main building of Seoul Station. It is now closed for passengers and houses a museum instead. 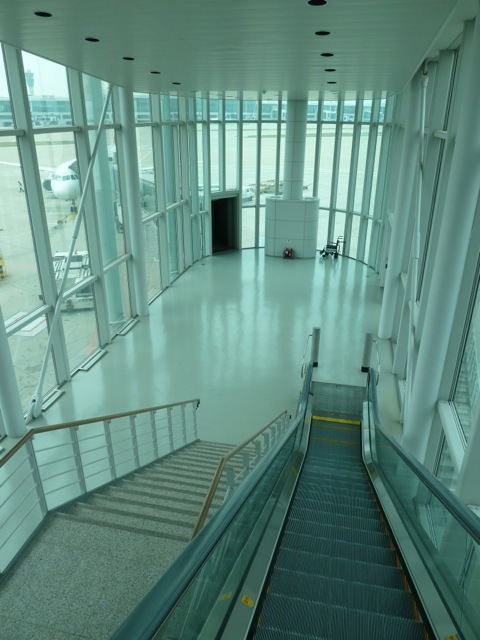 The Airport Express station is on the second basement floor, the platform for the train is five floors further down on the seventh basement floor. 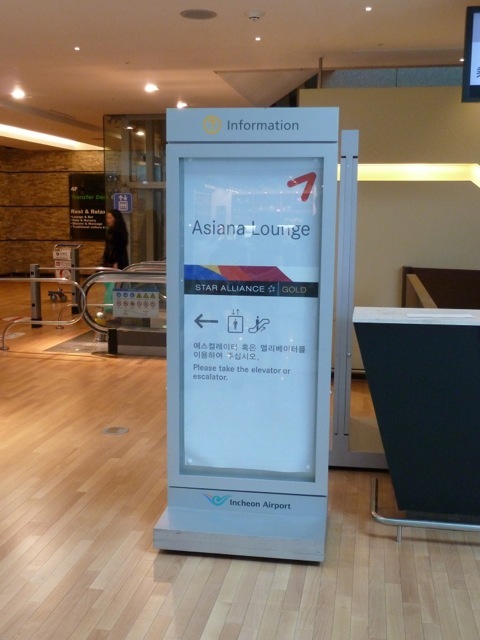 At Seoul Station some carriers, including Asiana Airlines, provide the possibility to do check-in and even immigration. I’ll have to try this some other time as I only have four minutes to spare before the train leaves. 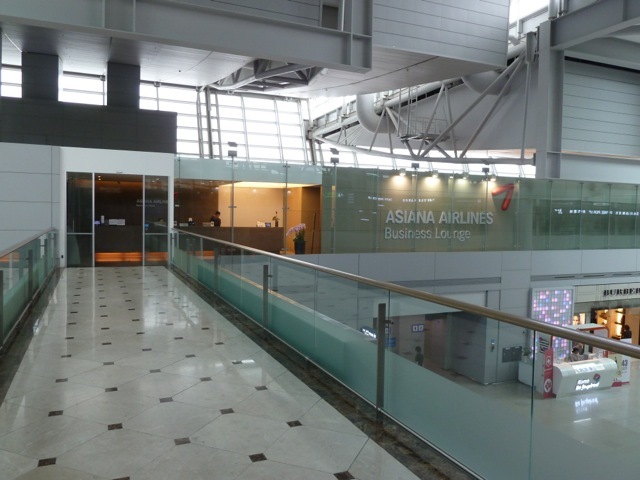 Once I arrive at the airport, I find the Asiana Airlines check-in counters to check if they will accept the SWISS branded boarding card I was issued in Basel two days previously. 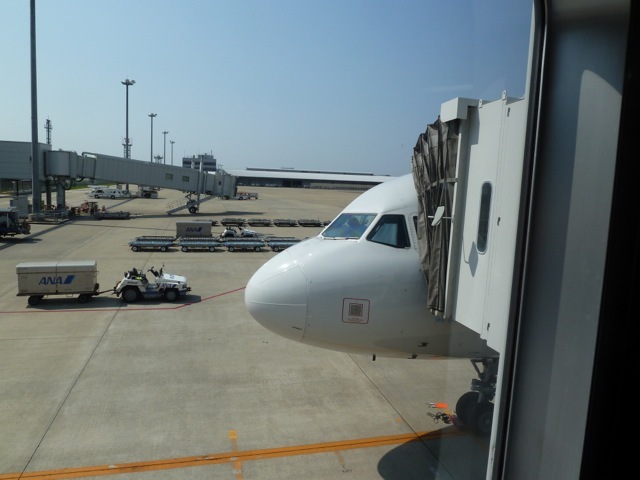 The agent looks at my passport, tells me everything is fine and writes the number of the gate on the boarding card for me. After that I head for security, which, although very busy, is also highly efficient. 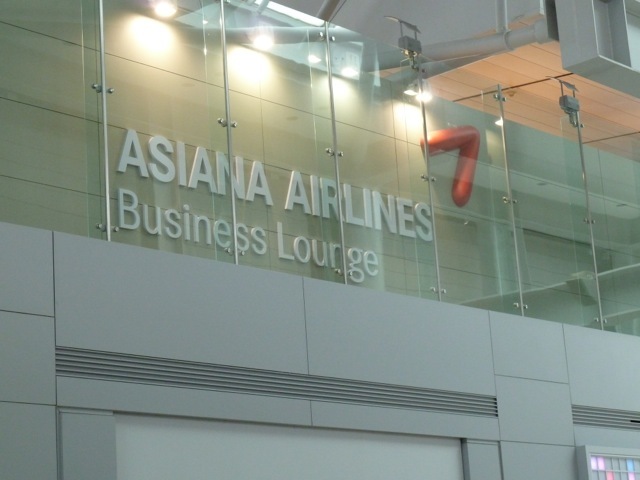 After security and emigration I head for the Asiana lounge one floor up. The receptionist welcomes me to the lounge and tells me that I need to exchange my SWISS boarding pass for an Asiana Airlines branded one first. 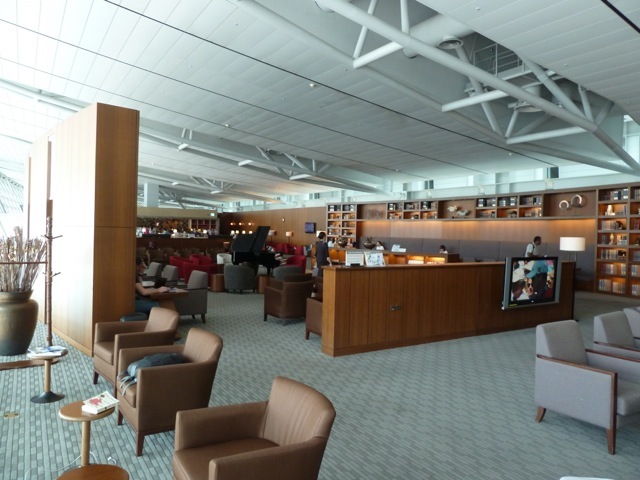 Fortunately the transfer counter is right opposite the entrance to the lounge. So I do that, no idea what the point of all this is though, and then return. 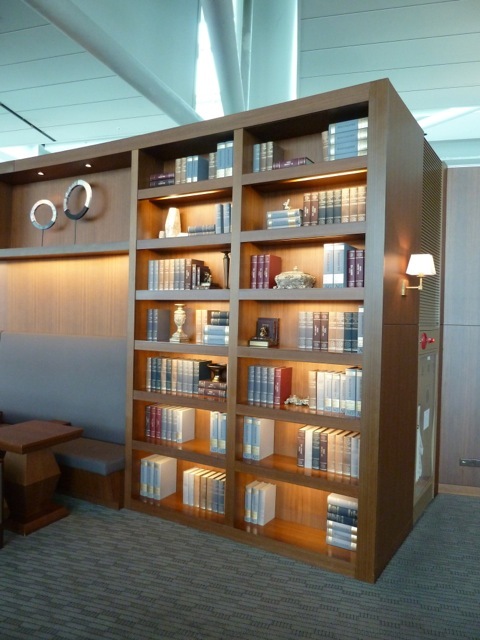 The lounge is elegantly appointed, but there are a few odd items: a piano that does not make a sound and shelves of faux books – covers with empty pages. 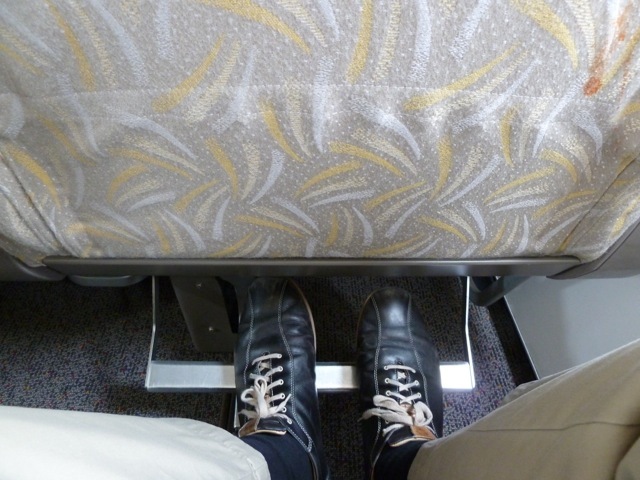 The lounge is not too full and I manage to secure a comfortable seat by the window. I pass my time watching the action on the ramp. 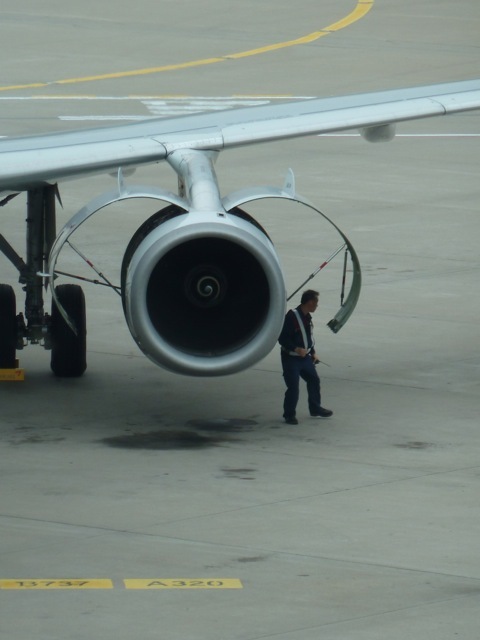 When I arrive at the gate I find my bird standing there with a bunch of engineers peering into the left engine. The cowling is open. 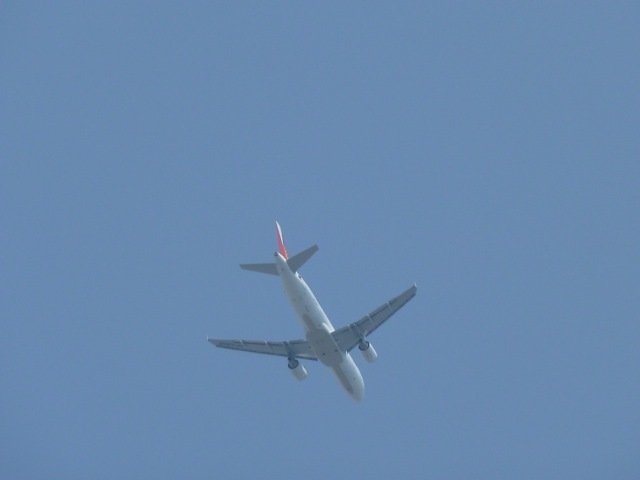 It is only when I take a closer look that I realise they are doing an engine test. Standing so close to it the noise must be deafening. 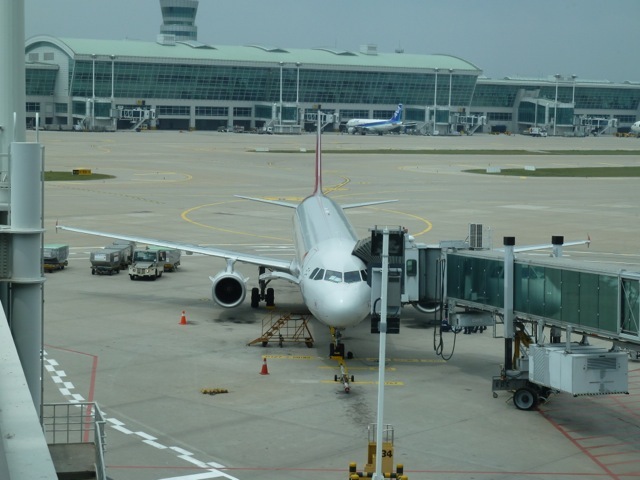 The gate attendant announces that there will be a delay for technical reasons. Indeed! Eventually boarding commences some thirty minutes behind schedule. 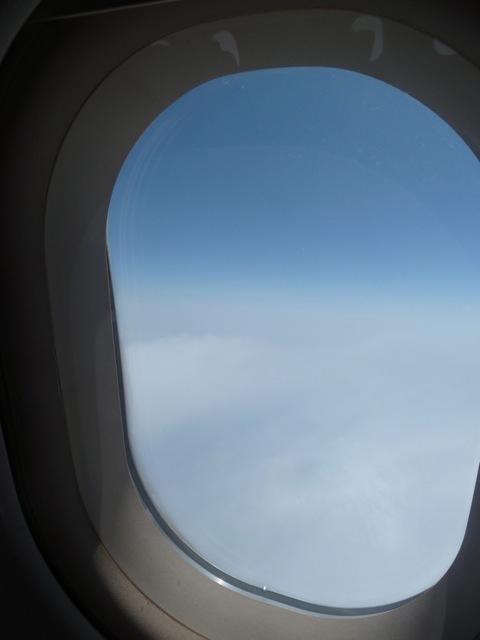 But the flight time is calculated at just under one hour, so we are able to make up time en route. 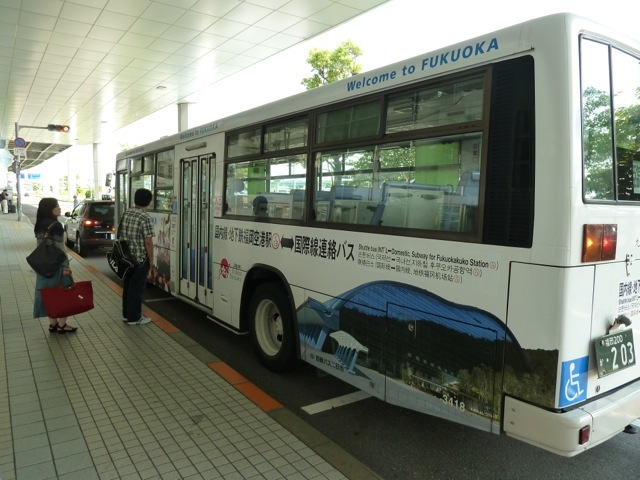 By the time we arrive in Fukuoka we are only 15 minutes behind schedule. 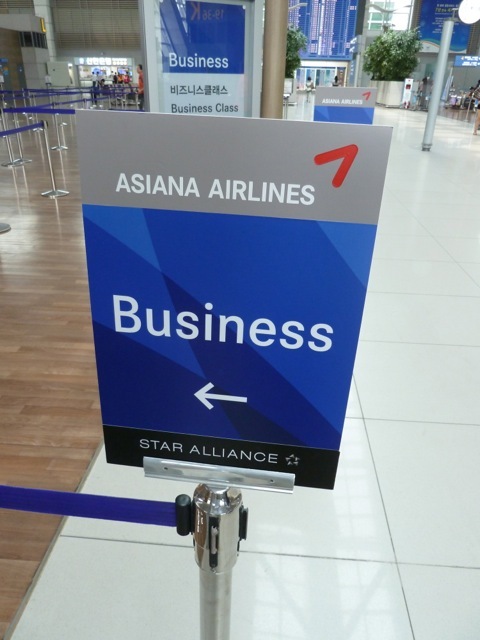 Asiana Airlines has a dedicated Business Class on its Airbus narrow-bodies. 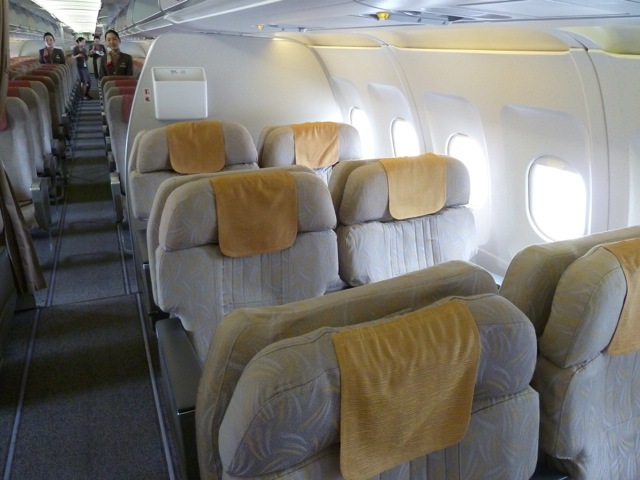 There are three rows with four seats on each row, for a total of twelve seats. 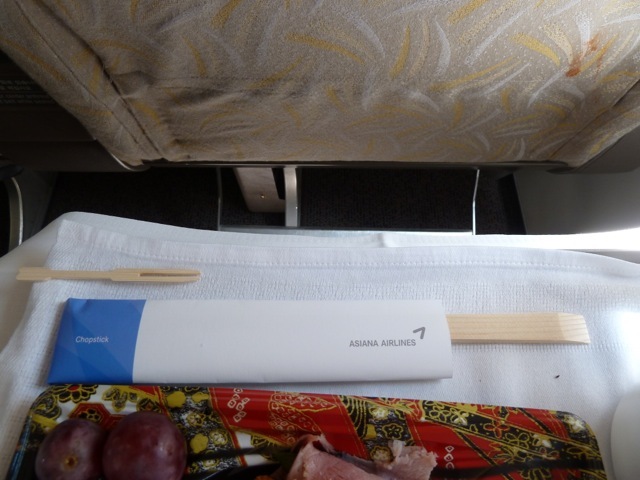 The colours and patterns are the same as in First Class on the B 747-400. 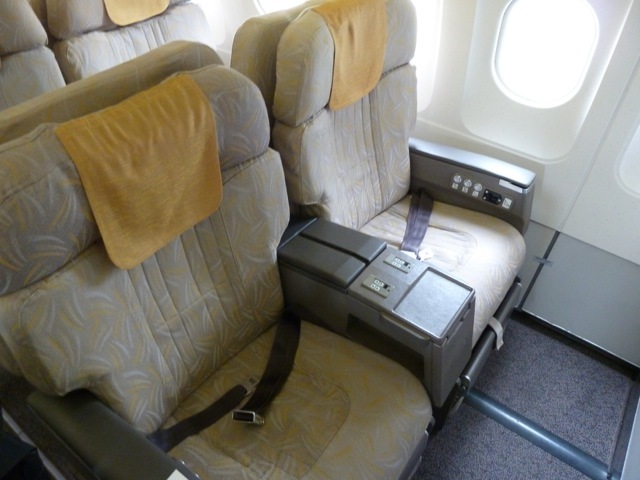 The seat is incredibly wide, has amazingly soft cushions, a footrest and is tremendously comfortable. 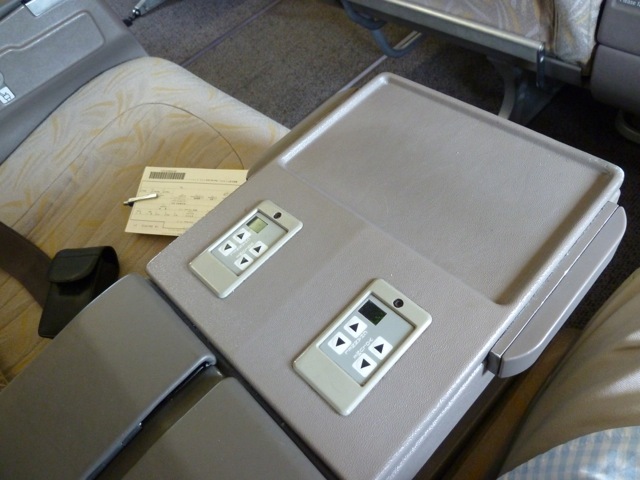 I arrive at my seat to find earphones, the menu and a pair of slippers placed in the seat pocket. 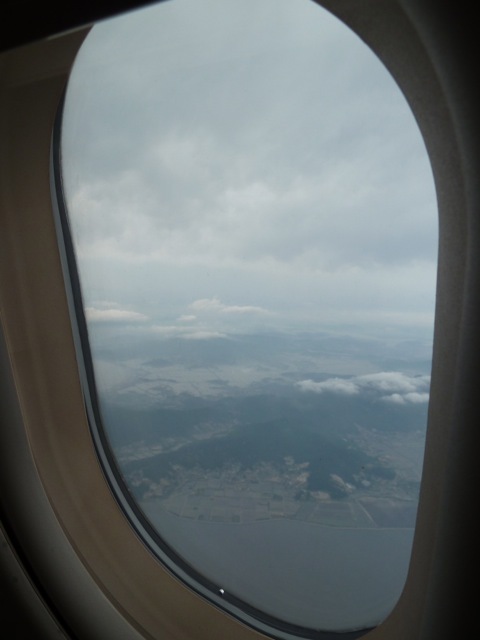 Take-off is to the north and as soon as we get airborne we experience some heavy turbulence which lasts for about 20 minutes during the climb. We bank to the right, making sure to avoid getting even remotely close North Korean airspace. 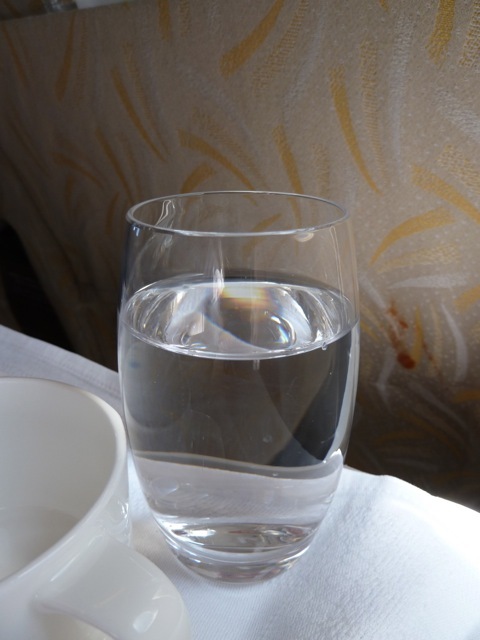 There are two flight attendants working the Business Class section on this flight. 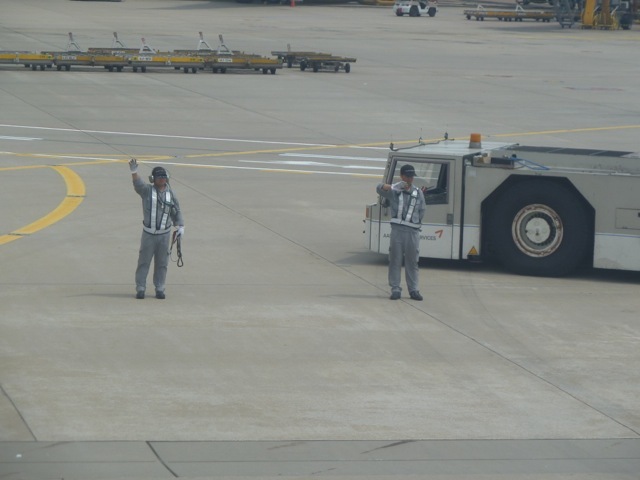 Again the crew seem friendly enough. 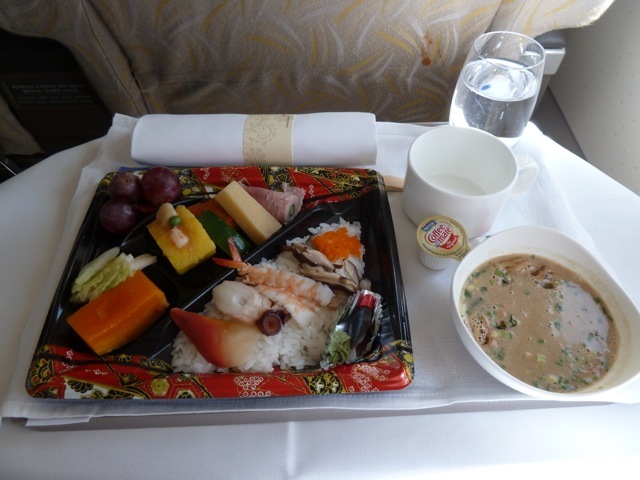 Service begins with one of the flight attendants passing through the cabin with the customs and immigration forms for Japan. 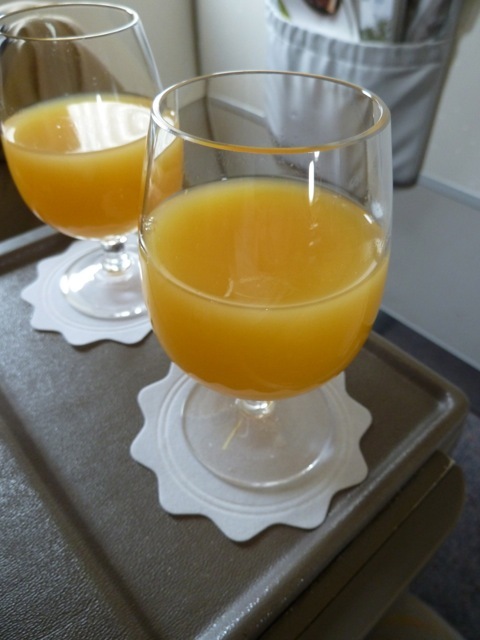 While we’re still on the ground and once boarding is completed, the lead flight attendant passes through the cabin offering either water or orange juice for a welcome drink. 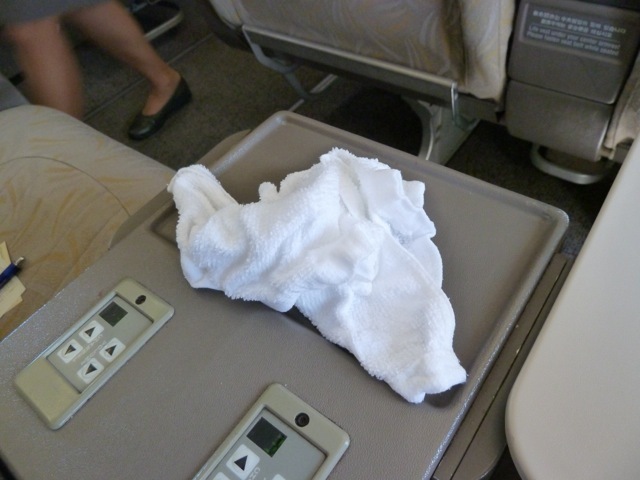 This is followed by a hot towel. 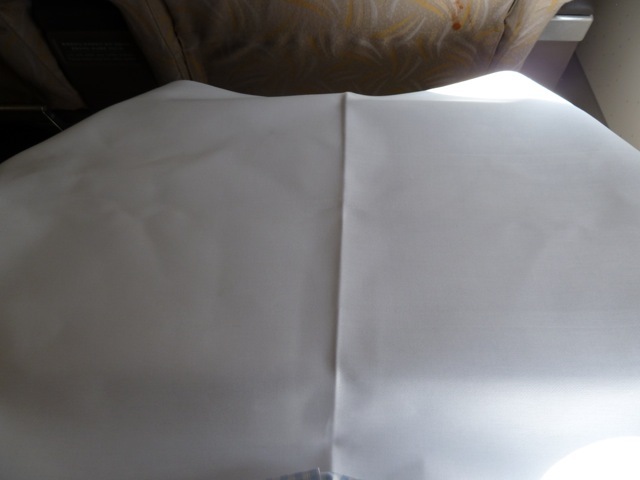 When eventually the fasten seat belt sign goes off, my table is set with a crisp linen tablecloth. I have a Perrier to drink and then later on a coffee. 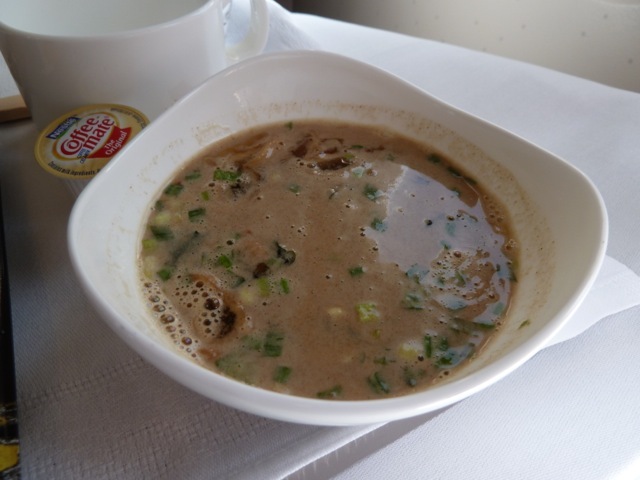 During the meal the crew serve green tea. 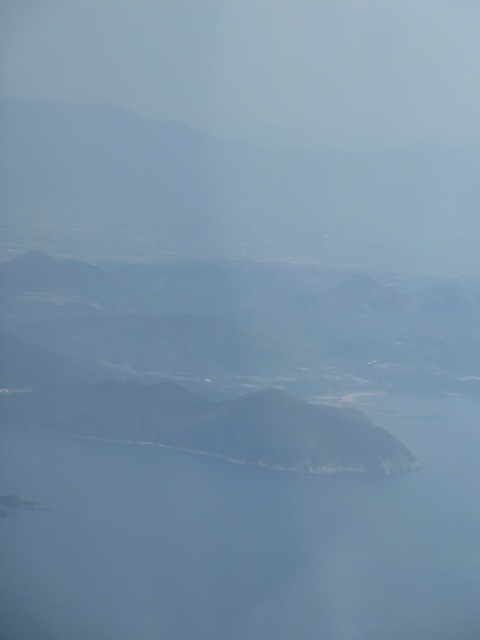 The approach into Fukuoka is pretty spectacular. 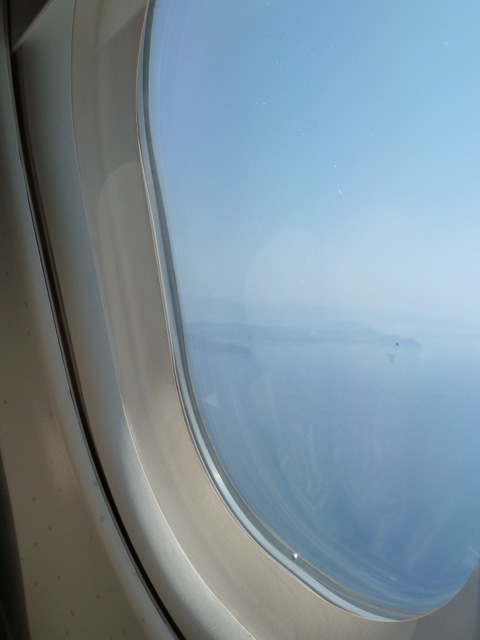 First we fly in over the sea, along the cost. 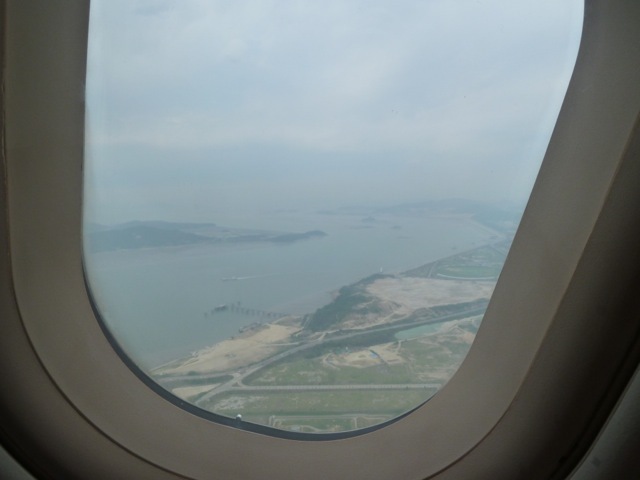 Then we bank right and fly right over the city towards the hills in the background. The hills begin to close in around the aircraft and you begin to wonder where on earth you are actually going. I hear the sound of the autopilot being disengaged and shortly thereafter we bank sharply to the left to execute a 180 degree turn at an interestingly low altitude. 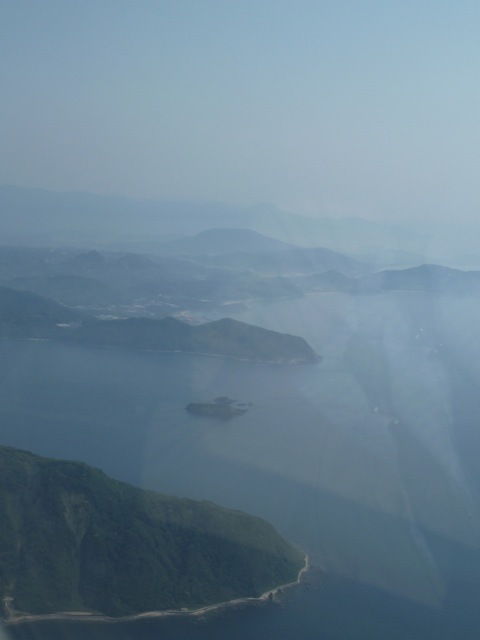 It reminds me a bit of the approach to Hong Kong’s old Kai Tak airport. Eventually we come out of the turn, the wings are levelled again and we gracefully glide down onto the runway. Nice one captain! 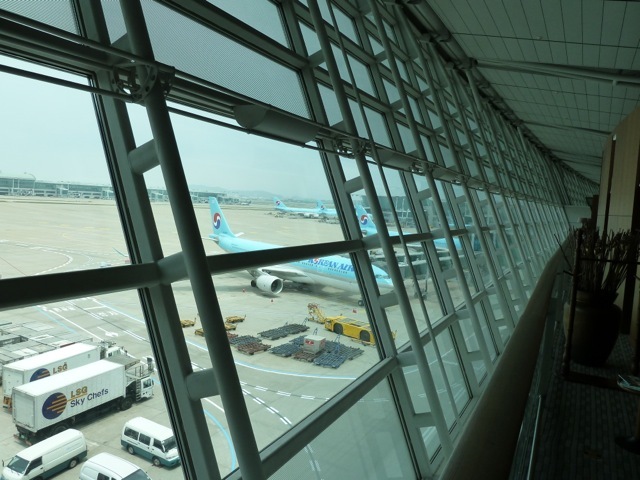 Fukuoka has an international terminal and a domestic terminal, which are located on either side of the runway. There is the metro into town from the domestic terminal. To get there I take the free shuttle across the airfield, the route of which actually takes you airside again. It is an interesting route and runs between the masts of the approach light markings as you round the runway threshold. 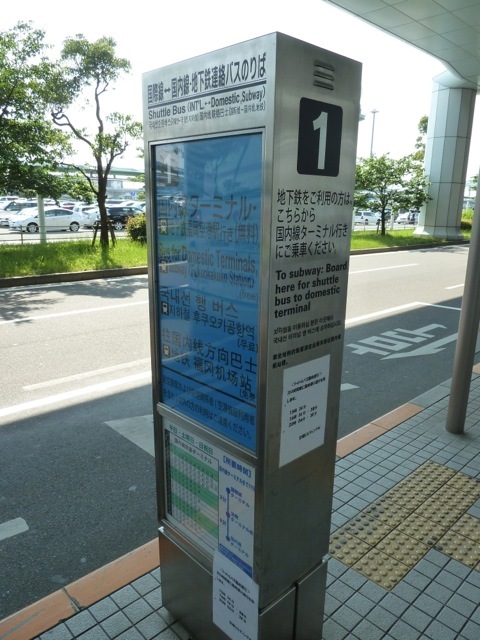 Once you reach the other side, the bus passes another gate and you find yourself landside once again. The only problem on this particular occasion is that the bus is stifling. It is so hot and muggy that it takes your breath away. But luckily the journey does not take too long to complete. 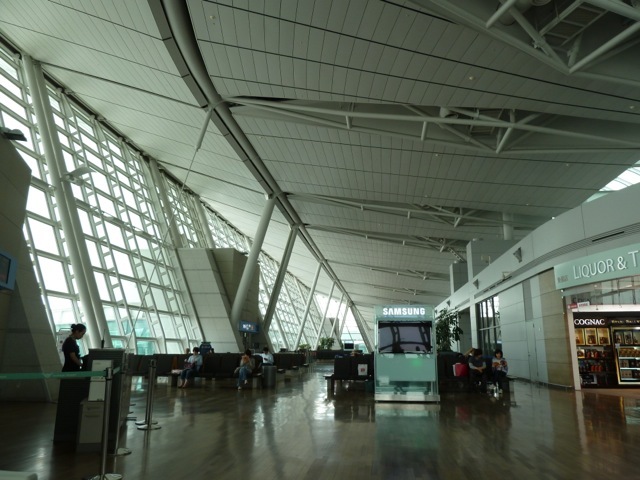 The domestic terminal is divided into sections, although I am not exactly sure according to what criteria. 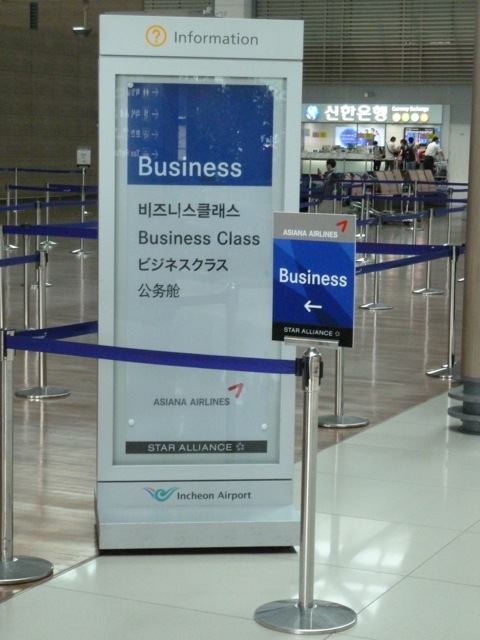 One would expect there to be separate sections for ANA and for JAL, but that does not seem to be the case. The trip into town only takes 5 minutes by metro. 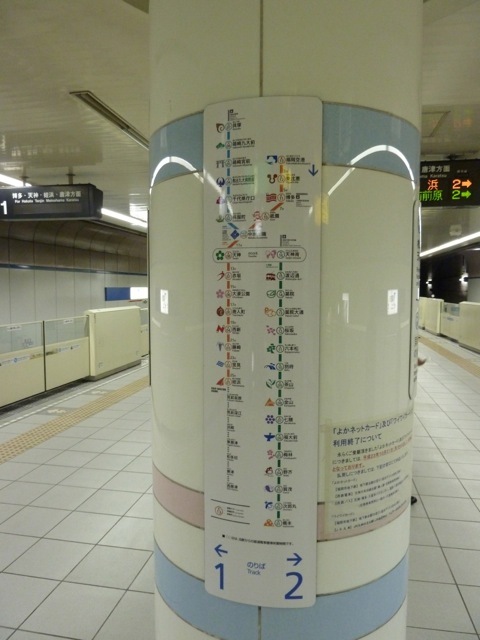 I get out at the second stop, which is Hakata main station. 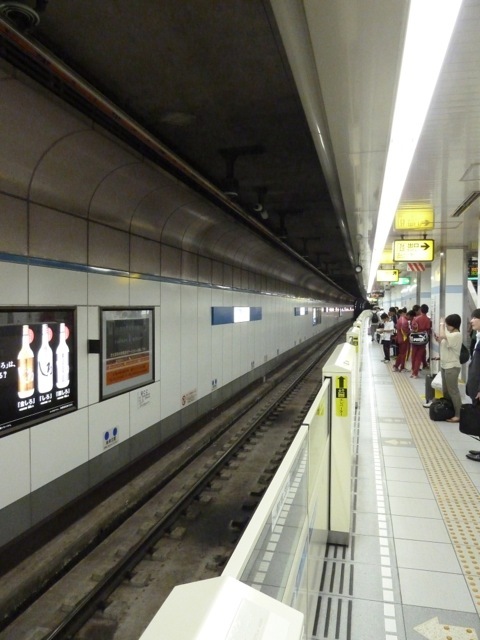 From where there are connections onto the JR Shinkansen mainline routes. 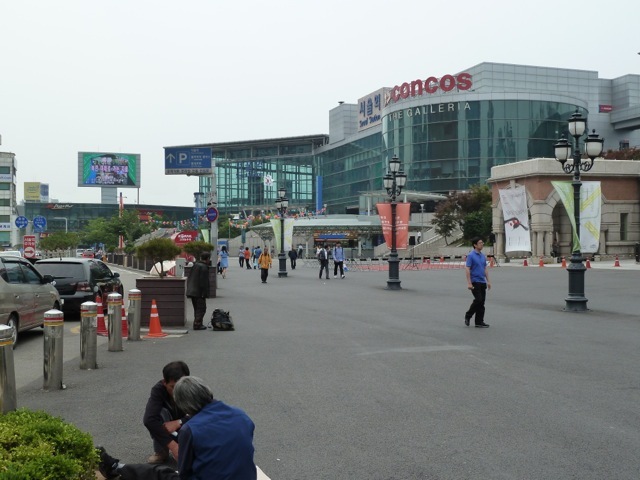 My hotel is in a shopping mall complex known as Canal City and is some 10 minutes away from the station on foot. 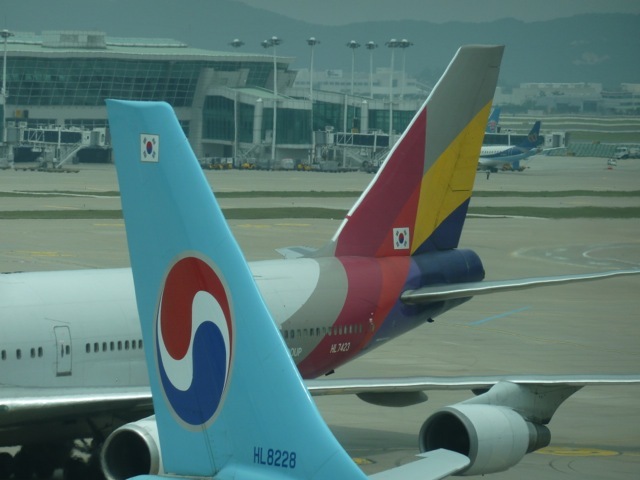 On this flight Asiana Airlines certainly showed consistency in its service in that the flight, although a very short one, was equally pleasant as my trip from Frankfurt to Seoul with them the previous day. 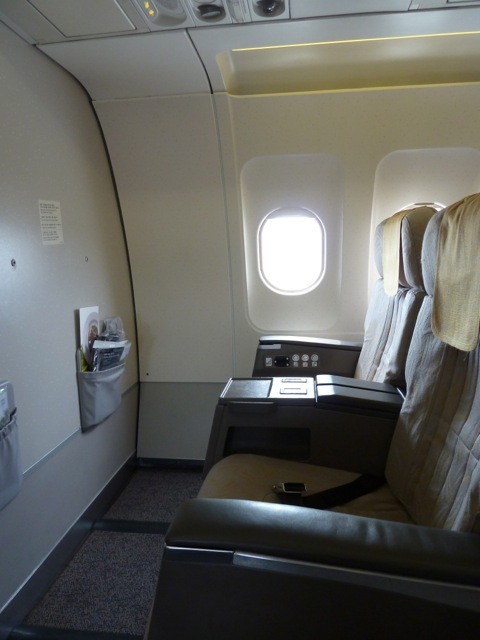 The Business Class seat is positively enormous and the crew were pleasant, professional and charming. The food is possibly a matter of taste. 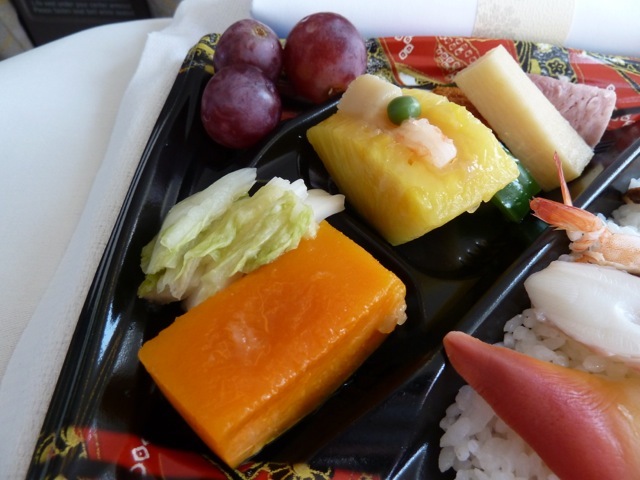 Asiana Airlines are certainly catering for the Japanese market here. 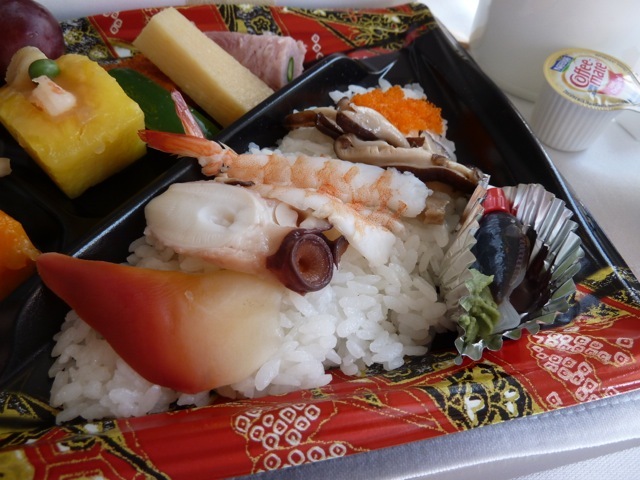 I like Japanese food, so I don’t mind. But I can imagine there may be people who would not have enjoyed this meal so much. 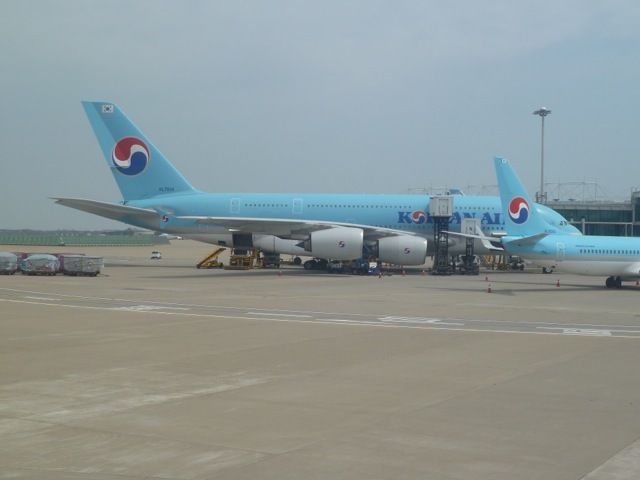 This entry was posted in Airbus A 321, Asiana Airlines, Business Class and tagged airline asiana, airlines, asiana airlines, asiana airlines flight, aviation, business class seat, incheon airport, seoul station, transportation, travel, vacation. Bookmark the permalink.